(Nanowerk News) Laser physicists have built a tractor beam that can repel and attract objects, using a hollow laser beam that is bright around the edges and dark in its centre ("A long-range polarization-controlled optical tractor beam"). It is the first long-distance optical tractor beam and moved particles one fifth of a millimetre in diameter a distance of up to 20 centimetres, around 100 times further than previous experiments. “Demonstration of a large scale laser beam like this is a kind of holy grail for laser physicists,” said Professor Wieslaw Krolikowski, from the Research School of Physics and Engineering. 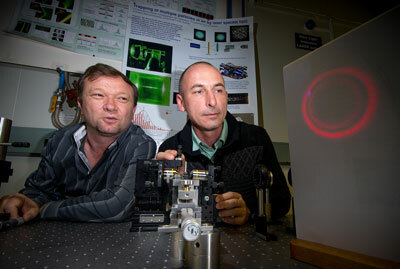 Dr Vladlen Shvedov (L) and Dr Cyril Hnatovsky adjusting the hollow laser beam in their lab at RSPE. The new technique is versatile because it requires only a single laser beam. It could be used, for example, in controlling atmospheric pollution or for the retrieval of tiny, delicate or dangerous particles for sampling. The researchers can also imagine the effect being scaled up. “Because lasers retain their beam quality for such long distances, this could work over metres. Our lab just was not big enough to show it,” said co-author Dr Vladlen Shvedov, a driving force behind the ANU project, along with Dr Cyril Hnatovsky. Unlike previous techniques, which used photon momentum to impart motion, the ANU tractor beam relies on the energy of the laser heating up the particles and the air around them. The ANU team demonstrated the effect on gold-coated hollow glass particles. The particles are trapped in the dark centre of the beam. Energy from the laser hits the particle and travels across its surface, where it is absorbed creating hotspots on the surface. Air particles colliding with the hotspots heat up and shoot away from the surface, which causes the particle to recoil, in the opposite direction. To manipulate the particle, the team move the position of the hotspot by carefully controlling the polarisation of the laser beam. “We have devised a technique that can create unusual states of polarisation in the doughnut shaped laser beam, such as star-shaped (axial) or ring polarised (azimuthal),” Dr Hnatovsky said.